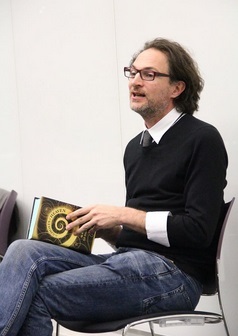 On Tuesday 24th February, students from the two Creative Writing MAs were privileged to welcome author Marcus Sedgwick to the University. Marcus spoke in detail about his latest novel The Ghosts of Heaven. This set the tone for the evening and the audience, as one, sat up to pay attention. ‘It’s not just me then who finds it difficult,’ our body language seemed to say. Marcus captivated us straight away. He was going to share his difficulties and tell us how he overcomes them. Concentrating on this one novel he shared how it was conceived from the image of the spiral. Producing a caliper from his pocket he showed how it is used in measurement. It was a symbol of his precision, as a writer too. In a few minutes he took us through ‘the spirals of life’, reminding us of Fibonacci and the golden ratio in nature: sea shells, sunflowers, honey bees and galaxies. This, he told us, was how the idea of the book was formed. Furthermore this image was crucial in drawing his stories together to form a coherent novel. Asked how long this process took, he raised an eyebrow. ‘Twenty years? Certainly six to seven years in writing.’ There was a long pause for us to register this. We weren’t going to write that successful novel by the end of the course, at this rate. But at least those wonderful ideas that swirl around in our heads – amoebas, foetuses struggling to grow and take shape – with effort, might one day find their way on to that blank sheet of paper in a worthwhile form. Marcus read to us from ‘Whispers in the Dark’ which helped us appreciate its poetic form. The protagonist is a girl of the first humans who discovers writing through her cave painting. She is ‘The one who walks into darkness, when others cling to light.’ She depicts the risk-taking of the youthful mind, so essential in the evolution of humankind, according to the author. The protagonist of ‘The Witch in the Water,’ set in medieval Yorkshire, is a female also. She is accused of being a temptress or witch. She understands a deeper meaning of the spiral: ‘It was all the same thing: the same sign, and now she knew what it meant.’ The meaning of the spiral now has supernatural meaning too. In ‘The Easiest Room in Hell’ the protagonist is trying to cure a mad poet while suspecting he might be insane himself. Marcus explained that this story was conceived from visits to disbanded mental hospitals in The United States. He gave us a detailed account of how this story took form, showing us photographs to ground the story in reality. Evidence like this helps us appreciate how a story can take root. The theme is then developed through the image of a spiral stairway, which, to the insane mind of the poet, is seen as a threat. Asked about his choice of protagonists, Marcus is adamant that younger readers have no problem identifying with adult characters. What he considers important is to challenge readers, whatever their age, intellectually and emotionally even if it means disturbing them too. He leaves many questions unanswered in his work and this is what makes his books so intriguing. As for advice: Rather than ‘telling’ us how, Marcus showed us how he writes. This entry was posted in Winchester Reading Series 2015 and tagged Fibonacci, golden ratio, Marcus Sedgwick, The Ghosts of Heaven, words, writing by Litmus 2015. Bookmark the permalink.